New Home Sales slowed into the New Year but the market for newly-built homes remains strong. For home buyers in New York and nationwide, December’s New Home Sales report is yet one more signal that the housing market recovery may be underway. According to the Census Bureau, the number of new homes sold in December 2011 slipped 2 percent to 307,000 units on a seasonally-adjusted, annualized basis nationwide. A “new home” is a home that is considered new construction; a home for which the buyer will be the first owner and tenant. 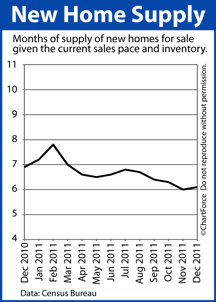 As compared to December 2010, last months’ sales volume fell seven percent. It’s a statistic that suggests housing market weakness. However, in looking at a different component of the New Home Sales report — the supply of homes for sale — we’re forced to reconsider. At the current pace of sales, every new home for sale nationwide would be “sold” in a matter of 6.1 months. Economists believe that a 6.0-month supply defines a market in balance — anything quicker is termed a “seller’s market”. Statistics like that are enough to create urgency among today’s Westchester home buyers. Unfortunately, the Census Bureau’s data may be wrong. Although December’s New Home Sales report shows sales down 2 percent, the government’s data was published with a ±13.2% margin of error. This means that the actual New Home Sales figure may have been as low as -15.2 percent, or as high as +11.2 percent. And, because the range of possible values includes both positive and negative numbers, the Census Bureau had no choice but to assign its December data “Zero Confidence”. It will be a few months before final revisions are made to December New Home Sales data. Until then, therefore, buyers should take cues from the market-at-large and the market-at-large hints at recovery. One example of this is homebuilders showing more confidence in their product than at any time in the last 5 years. If your plans for 2012 call for buying new construction, therefore, consider using this lull to “make a deal”. As the year progresses, the great values in housing may be gone. When a home is listed for sale, its “clutter” can be the difference between a rapid sale and no sale at all. Clutter, in its strictest sense, is defined as anything untidy; or in a disorderly state. In real estate, the term is broadened to include unnecessary furniture pieces; unwieldy artwork or collections; stacks of papers and/or magazines; and anything that otherwise restricts the open flow of a home’s floor plan. In other words, clutter is anything that distracts from your home’s natural footprint. As a home seller in Manhantten , understanding how your home’s clutter can affect a buyer is paramount to helping your home sell faster, and at a higher contract price. First, there’s the psychological angle. A potential home buyer may see clutter and think “mess”. Few people want to buy a house they find messy or otherwise disorganized. Second, there’s the practical angle. A home that appears full of “things” also appears as if its lacking in storage space. This, too, can turn off buyers. When you list your home for sale, here are basic tips to de-clutter your home. Some of this advice may not be practical with respect to your home, in particular, so make sure to ask your real estate agent for follow-up help. In each room, remove photos, trophies, plaques and other personal items on display. Remove large collections such as dolls, cars, miniature cans, and the like. You should also consider removing distinctive artwork from your walls, or replacing pieces with items that are more bland. The over-reaching goal of de-cluttering is to depersonalize and neutralize your home so a buyer can visualize himself/herself living there. De-cluttering your home can also make your home appear larger, accentuating the features of each room. It’s no wonder that minimally-cluttered homes tend to have a wider appeal among buyers. After 3 consecutive months of growth, the housing market appears to have eased a bit in December. According to the National Association of REALTORS®, December’s Pending Home Sales Index slipped 4 percent from the month prior. The index measures the number of homes under contract to sell nationwide, but not yet sold. Despite falling below its benchmark “100 value”, December’s Pending Home Sales Index is the reading’s second-highest value since April 2010 — the last month of last year’s home buyer tax credit program. In other words, the housing market continues to show signs of improvement, propelled by low home prices and the cheapest mortgage rates of all-time. Freddie Mac’s mortgage rate survey put the 30-year fixed rate mortgage at an average of 3.96% in December — a 75-basis point improvement from December 2010. This helps to make homes more affordable nationwide. But even regional data is only so helpful. Like everything in real estate, data must be local to be relevant. Throughout the West Region, for example, the U.S. region in which pending home sales fell the most, several states must have performed better than the regional average. And, undoubtedly, there were cities, towns, and neighborhoods that experienced marked market growth. Unfortunately, the Pending Home Sales Index can’t capture that data. Nor can it identify the markets in which home sales suffered. For today’s Westchester home buyers and sellers, therefore, it’s important to understand your local market and the drivers of local activity. Reports like the Pending Home Sales Index can paint a broad picture U.S. housing but for data that matters to you, you’ll want to look local. 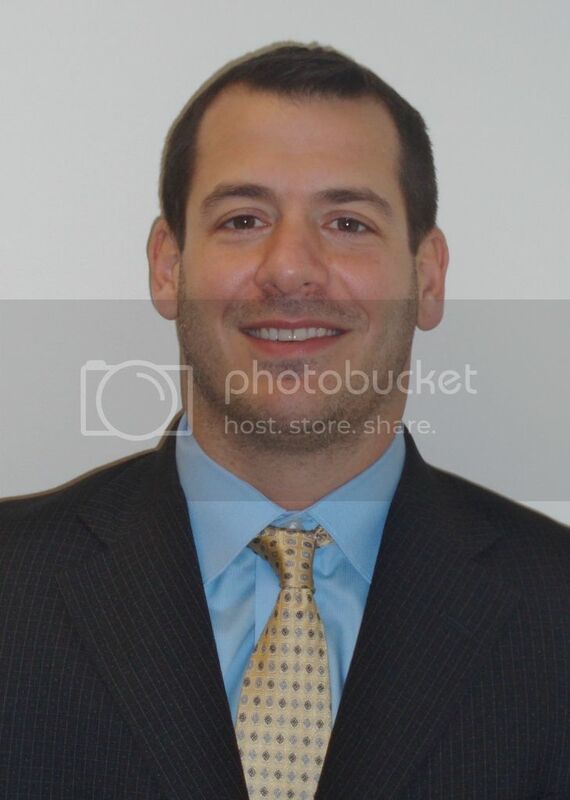 For local real estate data, talk to an experienced real estate professional. Wednesday, the Federal Reserve’s Federal Open Market Committee voted to leave the Fed Funds Rate unchanged within its current target range of 0.000-0.250 percent. The Fed Funds Rate has been near zero percent since December 2008. For the third consecutive month, the Fed Funds Rate vote was nearly unanimous. Just one FOMC member dissented in the 9-1 vote, objecting only to the language used in the Fed’s official statement. In its press release, the Federal Reserve noted that the the U.S. economy has “expanding moderately” since its last meeting in December 2011, adding that the growth is occurring despite “slowing in global growth” — a reference to ongoing economic uncertainty within the Eurozone. On the positive side, the FOMC said that household spending is rising and inflation remains in-check. The group also believes that employment will gradually improve nationwide going forward. The Federal Reserve neither introduced new economic stimulus, nor discontinued existing market programs. Immediately following the FOMC’s statement, mortgage markets rallied, pressuring mortgage rates to fall in and around Bronx. Mortgage rates remain near all-time lows and, for homeowners willing to pay points plus closing costs, conventional, 30-year fixed rate mortgages can be locked at below 4 percent. If you’re in the process of buying or refinancing a home in New York , it’s a good time to lock a mortgage rate with your lender. 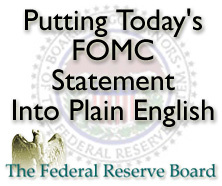 The FOMC’s next scheduled meeting is a one-day event slated for March 13, 2012. The Federal Open Market Committee adjourns from a scheduled 2-day meeting today, its first of 8 scheduled meetings this year. The FOMC is a designated, rotating, 12-person committee within the Federal Reserve, led by Federal Reserve Chairman Ben Bernanke. Members of the FOMC sub-committee are the voting members of the Federal Reserve; the ones that ultimately determine U.S. monetary policy. The most well-known Federal Reserve monetary policy tool is the central bank’s Fed Funds Rate. The Fed Funds Rate is the prescribed interest rate at which banks borrow money from each other for a period of one night. The Fed Funds Rate can only be changed by FOMC vote. For home buyers and would-be refinancing households in Westchester , it’s important to recognize that the Fed Funds Rate is an interest rate separate and distinct from “mortgage rates”. Mortgage rates are not voted upon by the Federal Reserve. Rather, mortgage rates are based on the price of mortgage-backed bonds, a security bought and sold among investors. Historically, there is little correlation between the Fed Funds Rates and 30-year fixed rate mortgage rates throughout New York. Going back 20 years, the benchmark rates have been separated by as much as 5.29% and have been as near as 0.52%. 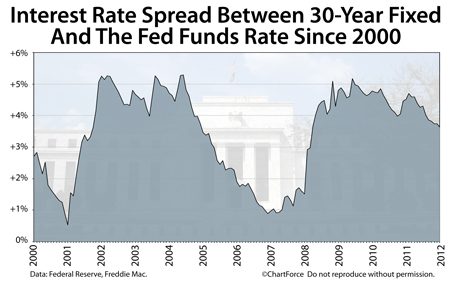 The spread has even gone negative, most recently in 1979 and 1981 — a period marked by high inflation. Today, the separation between the Fed Funds Rate and the average, 30-year fixed rate mortgage rate is roughly 3.60%. Beginning at 12:30 PM ET, however, that spread is expected to change. The FOMC will make its statement to the press at that time, and will release its quarterly forecast to the markets. As Wall Street reacts to the Fed’s press release and projections, mortgage rates will move. Investors expect the Fed to vote the Fed Funds Rate unchanged from its current range near 0.000 percent, but are unsure of how the Fed will characterize the U.S. economy. If the Fed speaks optimistically on the economy, stock markets should rise and mortgage bonds should fall, driving mortgage rates higher. Conversely, if the Fed shows concern for future economic growth, mortgage rates should drop. Either way, today figures to be volatile one for mortgage markets. When mortgage markets get volatile, the safe play as a rate shopper is to lock your mortgage rate immediately. There too much risk in floating. 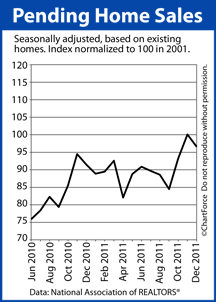 The housing market finished 2011 with strength, and is carrying measurable momentum into 2012. For today’s home buyer in Manhantten , December’s Existing Home Sales figures may be construed as a “buy signal”. Home supplies are dropping and buyer demand is rising. This is the basic recipe for higher home prices ahead. If your 2012 plans call for buying a home, consider that home values throughout New Jersey are expected to rise as the year progresses. The best values of the year may be the ones secured this winter. When Should I Change My Home’s Air Filters? How long has it been since you last changed your home’s air filters? Home air filters trap and remove dust and particles from the air you breathe; leaving “clean air” to circulate your home. Clean air in your home is important because it promotes better health. One way to keep to keep your home’s air as clean as possible is to replace its used air filters at least once per quarter; or once monthly in homes with shedding pets or that otherwise “get dusty”. Changing air filters is among the easier do-it-yourself chores for a Westchester homeowner; a task that takes less than one minute. The secondary benefit of doing it is that new filters help keep your HVAC unit in tip-top shape. Open the air filter compartment door/slider on your HVAC unit. Note the size of your current filter. It’s typically written on the frame. Note the direction in which the filter is pointing. There may be an arrow on its frame. Purchase a new filter at a hardware store. Make sure the sizes matches the size from Step 2. 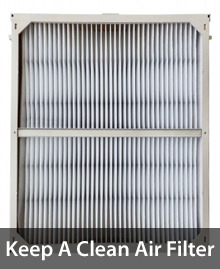 Replace old filter with the newly purchased one from Step 4. Make sure the arrow is pointing in the same direction as the original filter’s arrow. Using a marker, note the date of filter change on the side of the filter. Close the air filter compartment door/slider. When you find a filter type and style that you like, consider buying them in bulk — it can be helpful to have extra air filters laying around the home for when you need them — especially during season changes when you may want to replace filters more frequently. In addition, when purchasing air filters, don’t opt for the cheapest available. Often, the least expensive filters allow large particles to recirculate through the HVAC unit, and back in to your home. Choose a middle- or top-line product instead. Your home and your health will thank you.